On this audio edition of No Holds Barred, host Eddie Goldman previews the James Kirkland-Alfredo Angulo and Peter "Kid Chocolate" Quillin-Craig McEwan fights of November 5, and issues a challenge to MMA fans about the MMA vs. boxing debate. On Saturday, November 5, there will be three televised boxing cards in the U.S., and none of them on pay-per-view. Besides the Showtime card headlined by unbeaten IBF super middleweight champion Lucian Bute facing Glen Johnson, and the WealthTV card promoted by Don King headlined by WBA cruiserweight champion Guillermo Jones fighting Mike Marrone, HBO will have a doubleheader coming from Cancun, Mexico. 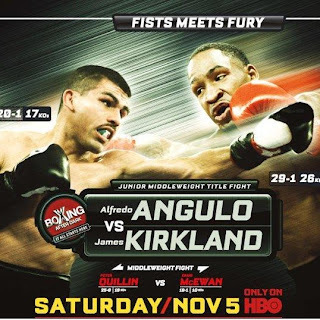 Two sluggers who very much need a big victory will face each other in the main event of the HBO card, as James Kirkland (29-1, 26 KOs) faces Alfredo Angulo (20-1, 17 KOs) in a 12-round, 154-pound WBC title eliminator. The first-round knockout loss earlier this year of Kirkland by little-known Nobuhiro Ishida, and the 2009 decision loss of Angulo to Kermit Cintron, halted the title quests of both these highly-touted fighters, so an impressive victory is essential for both Kirkland and Angulo. Most observers expect this one to be a memorable shootout, and it is not to be missed. Also on that televised card, the unbeaten Peter "Kid Chocolate" Quillin (25-0, 19 KOs) makes his HBO debut against Craig McEwan (19-1, 10 KOs) in a ten-round middleweight fight. McEwan is coming off the first loss of his career, a tenth-round TKO by Andy Lee in March. On a media conference call Monday, Kirkland explained how he has become a different fighter since his loss to Ishida. We also spoke with both Peter Quillin and Craig McEwan to get their takes on their fight. In addition, we issue a challenge to those MMA fans who watched the UFC pay-per-view this past Saturday headlined by the Nick Diaz-B.J. Penn fight. Our challenge: watch any or all of these three non-pay-per-view boxing cards this coming Saturday, November 5, and let us know whether or not they were better than the UFC pay-per-view. MMA World Expo. The mixed martial arts community comes to New York City, featuring the Renzo Gracie Gi Open 2011 tournament, a signing of his new book by MMA legend Randy Couture, grappling and muay Thai action, MMA fighters, seminars with world-class trainers, vendors, panel discussions, and much more. The third annual MMA World Expo takes place Saturday, December 17, and Sunday, December 18, at the Jacob Javits Center in New York City.